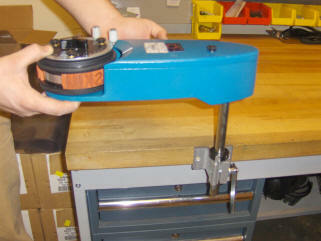 Pro Pack Solutions offers basic roller coders designed to work for your business. Kiwi Coders feature a fast implementation to ensure your carton coding is correct and compliant. If your date coding, adding a lot number or product identification that is consistent box after box and using a case sealer or motorized conveyor, you can lower your cost significantly by using roller coders over ink jet systems. The Kiwi line of coders are top of the line all metal marking devices that will yield years of service under extreme conditions. Information being printed can be changed in the matter of minutes by swapping out rubberized letters, numbers, or logos. The series 450 top, side or bottom coders for installation on conveyors and case sealers. Available in three different sizes: The Model 451 offer a printing area of 7/8" high, Model 452 offers 2" high, and the Model 453 offers 3 1/8" high. All messages run up to 12" in length. All three models offer enclosed housing incorporating a replaceable ink cartridge instead of a re-inkable cartridge requiring bottles of ink that can result in spilled ink! Anti-repeat assembly kit optionally available to prevent repeat printing on cartons longer than 16". Friction driven. Need consecutive numbering? The model 425 offers a 2 1/4" print area and incorporates a seven digit counter for number sequences from 1 to 9,999,999. Case speed up to 35 units per minute. Counter increments one digit at a time. Print height of number is 1/4". How about front and side operations? We offer the Series 460 Front and Side Coders to automatically imprint your coded information on the leading front panel and side. An air cylinder provides variable imprint pressure and a variable rate of return to print position. The unit is friction driven and re-indexes itself after each imprint. Three models available: 7/8", 2", and 3 1/8" maximum print heights. Base Lock logo mats and/or font and numbers available. Advise print size requirements. When ordering make sure to pick if you need left or right hand or top mounting. To determine left or right, look in the direction of the carton exit (away from you) and determine which side of the case sealer or conveyor you want to mount the unit on. Optional anti-repeat ring available. Ink roller not included. Select Pre-Inked or Re-Inkable cartridges. Finally select either Channelok or Base Lock logo mounting system. Click for 450 Series Operators Manual and Parts List in pdf format. Click for the KIWI SERIES 1100 RECIPROCATING CODER Instruction Manual with parts list. Email your requirements for more details.